When I have a knitting or crochet project on the go, I often store it in a plastic bag so it is easy to grab when I am heading out the door. When you have teens you are always spending time in the car waiting for them and it is good to have a portable project to keep you busy. 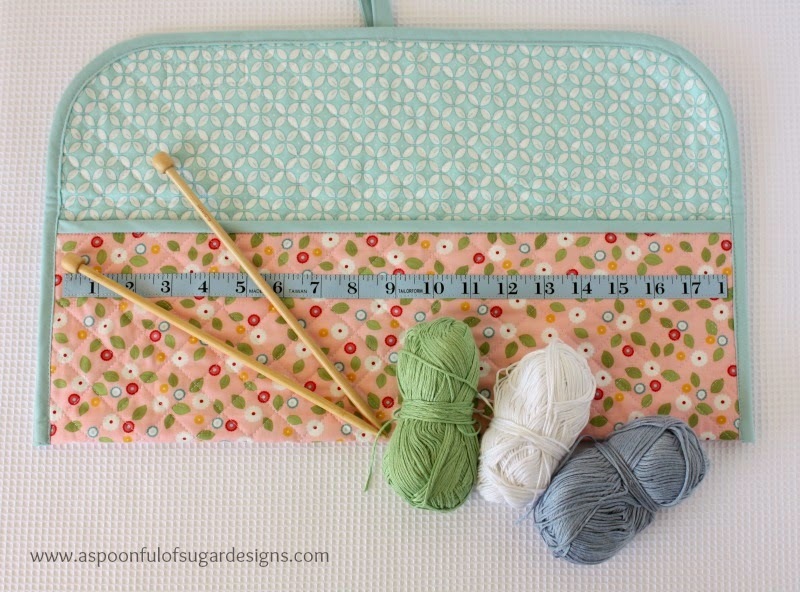 This handy knitting and crochet project pouch is the perfect size for crafter’s on the go. 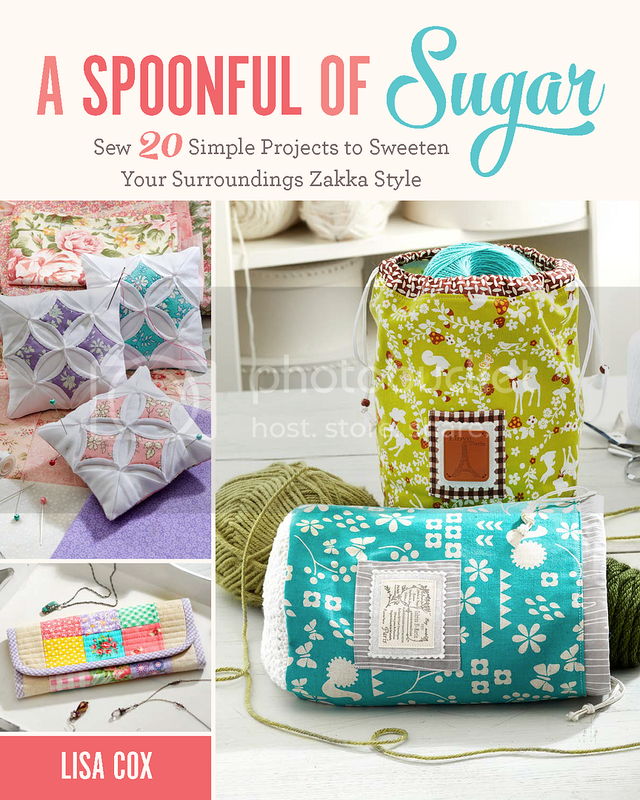 Stow your latest knitting or crochet project in style. It is easily constructed from three fat quarters of co-ordinating quilter’s cotton. 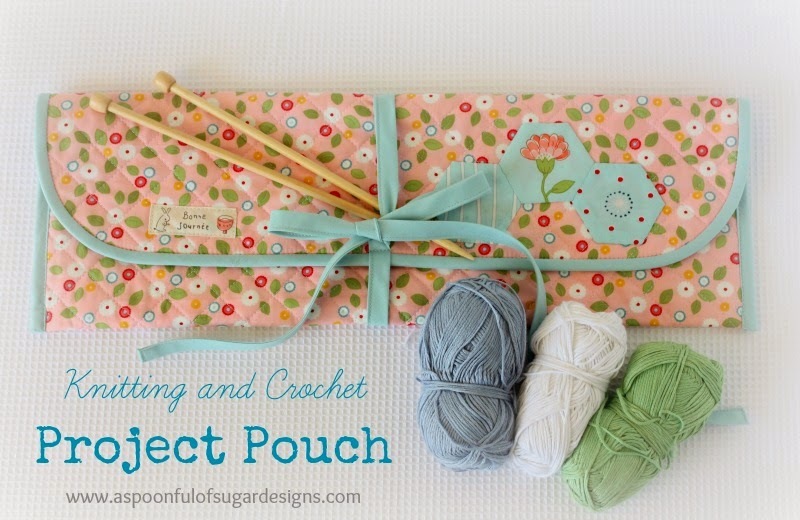 This knitting and crochet project pouch would make a great gift for a crafty type. 3 Fat Quarters of quilters cotton (for pouch, lining, and binding). All seam allowances are ¼ inch unless otherwise specified. Layer the lining fabric with the wrong side facing upwards, then the batting, and then the exterior fabric on top with the right side facing upwards. Pin the layers together using safety pins. Using the 45 degree angle mark on the ruler, mark a 45 degree angle using masking tape. Stitch along the angle using the masking tape as a guide. Reposition the masking tape at 1 inch intervals until the fabric has been quilted in one direction. 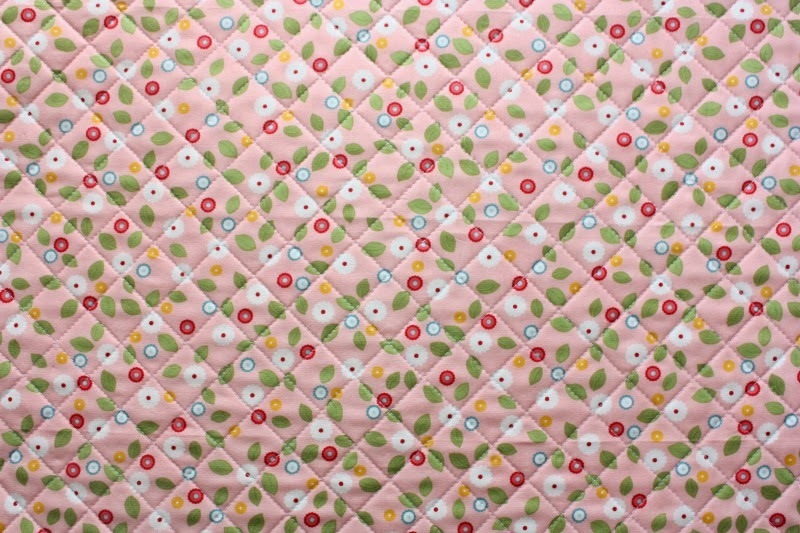 Using masking tape, position it at right angles to the stitched quilting and quilt in this direction until the piece of fabric is quilted in a cross hatch design. Trim the fabric to 19 x 17 1/2 inches. 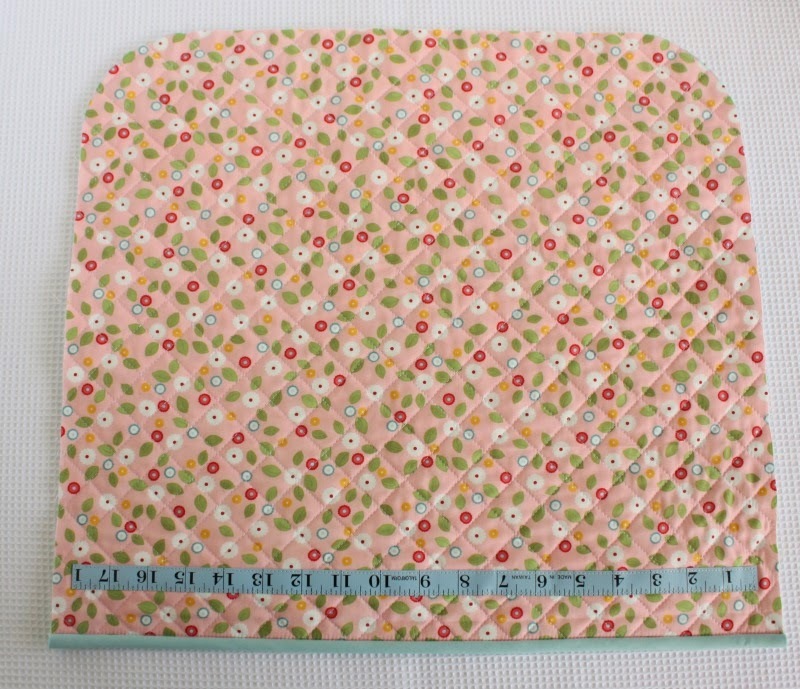 Cut 6 bias strips (cut at a 45 degree angle) that are 2 ¼ inches wide starting at the middle of the fat quarter of binding fabric and working outwards. 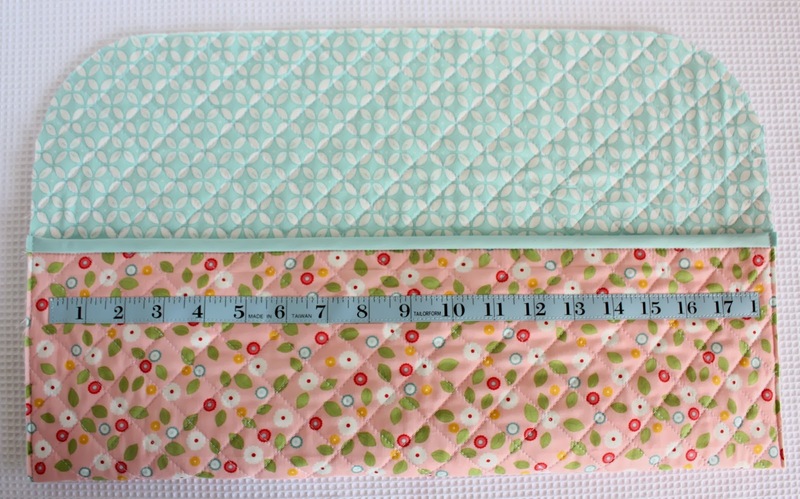 Stitch two bias strips together and press the seams open (approx length 44 inches) and trim to required length. 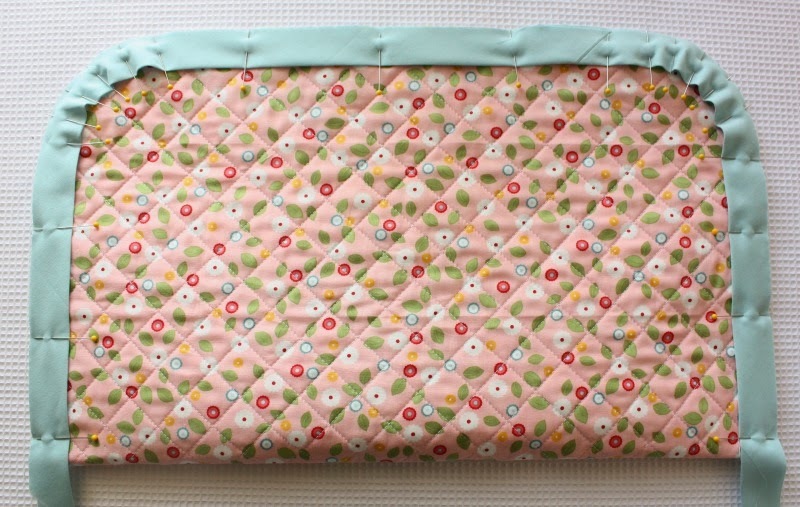 Stitch two strips together and press seam open ( approx length 48 inches) and trim to required length. Trim one strip to 20 inches. Take the 20 inch strip and the 44 inch strip and press them in half lengthwise. 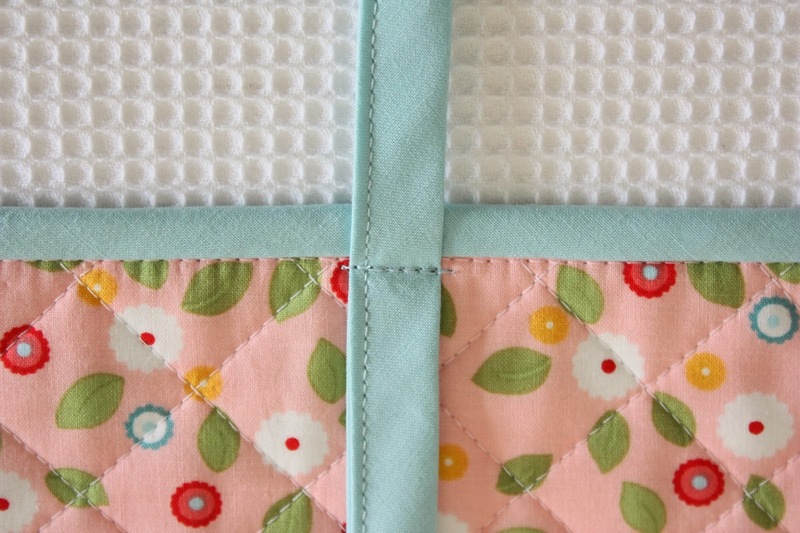 Pin the 20 inch strip to the bottom edge of the quilted square, matching up the raw edges. Stitch it in place, and trim the ends. 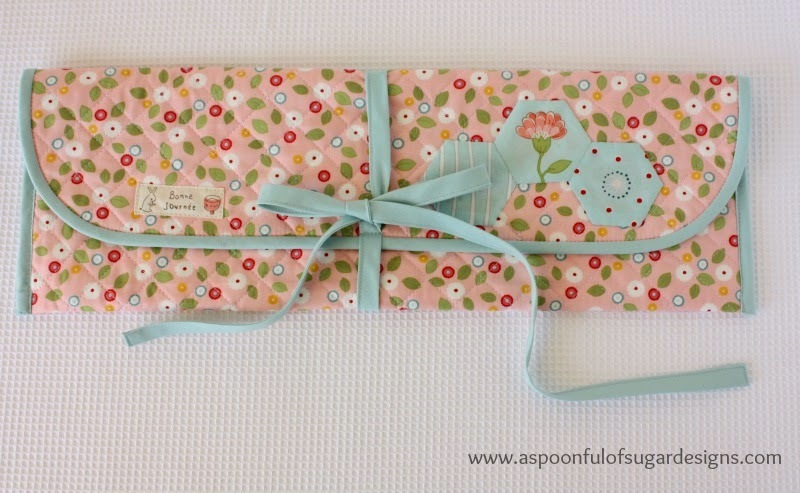 Fold the binding over to the lining side so it is covering the stitching line and pin in place. 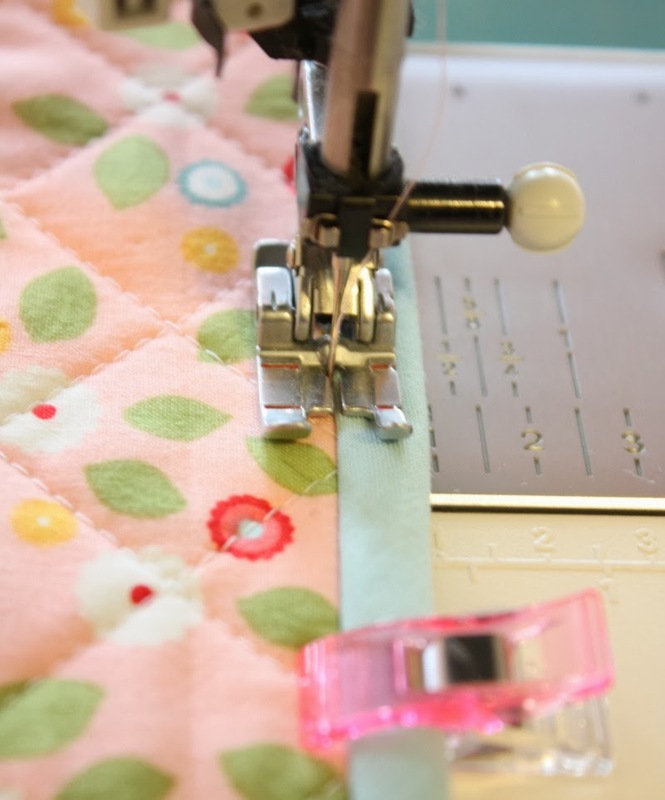 Turn the fabric over to the right side, and stitch in the ditch close to the edge of the binding so that it secures the binding on the lining side. Remove the metal clip from the end of the tape measure. Cut the tape measure to 18 inches. Position the tape measure 1 1/2 inches down from the bound edge and stitch in place using a jeans needle. Using a saucer as a template, round the top two corners of the pouch. The rounded part will become the flap. With the lining side facing upwards, fold the straight bound bottom edge up 6 inches. Pin in place and base using a scant seam allowance through both layers. Take the 44 inch bias strip. 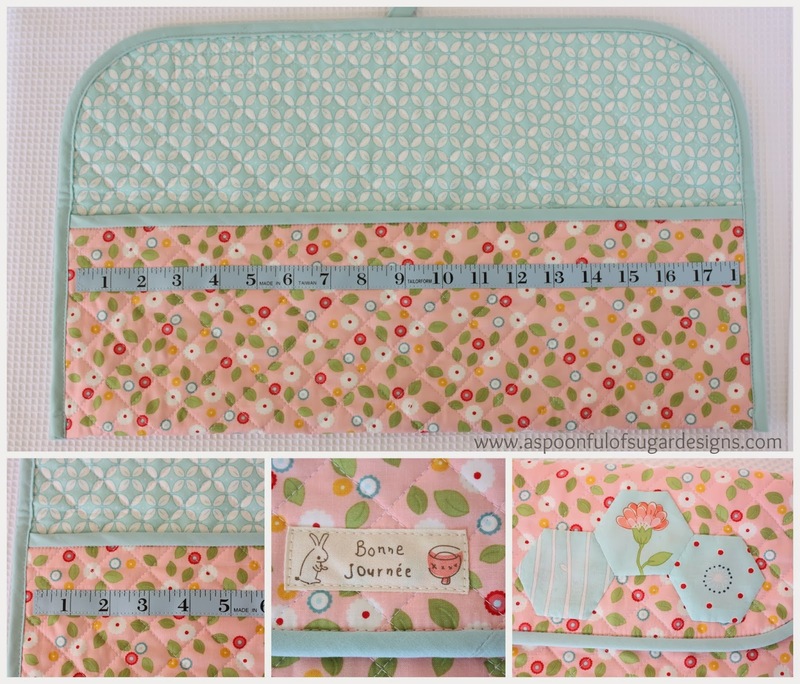 With the outside of the pouch facing upwards, pin the binding to the pouch, going from one corner, around the curved flap, and over to the other corner. There should be approx 1 inch overhand at each end. 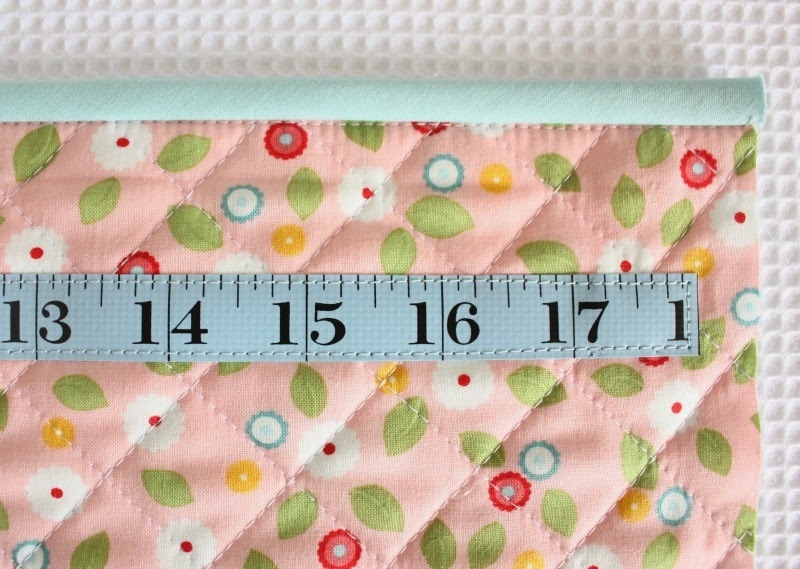 Match up the raw edges, and stitch in place using a ¼ inch seam allowance. 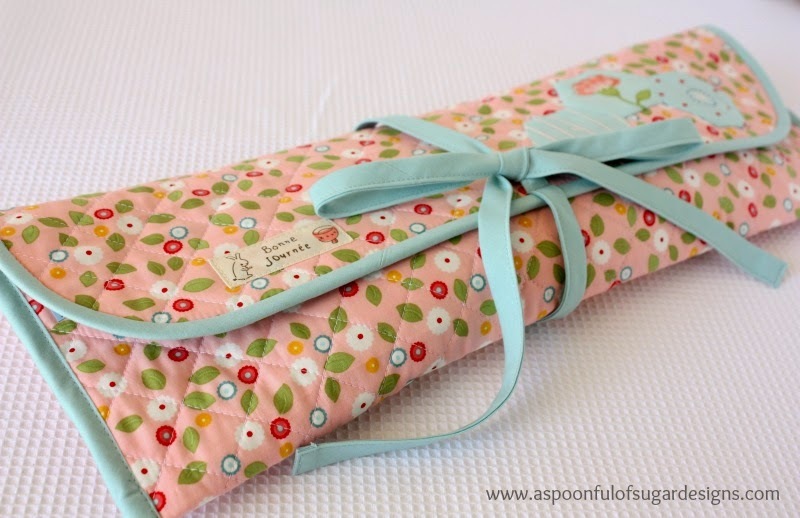 Take the 48 inch long bias strip, fold in half lengthwise and press. Open it up and fold both long edges into the centre crease line and press. Fold in half again so that you have a long strip that is 5/8 inch wide. Tuck in the ends, and stitch along the open edge. Stitch the bias strip to the mid point of the flap so that 16 inches is above the stitch line, and 28 inches is below the stitch line. This will form the pouch tie. (Optional) Stitch a label to the left hand side of the pouch. Hand stitch 3 hexagons to the right side of the pouch. Disclosure: Thanks to Windham Fabrics for supplying the Wallflowers fabric that was used in this project. This is DEFINITELY going on my Christmas gift list! And I know exactly who I am making it for! Thank you for sharing this Lisa! This is SUCH a good idea! I normally carry my knitting around in a carrier bag but this is much more glamorous. I’ll be making one this weekend! I love the pastel colors of the pouch! Oh Lisa, how lovely and practical this pouch is! 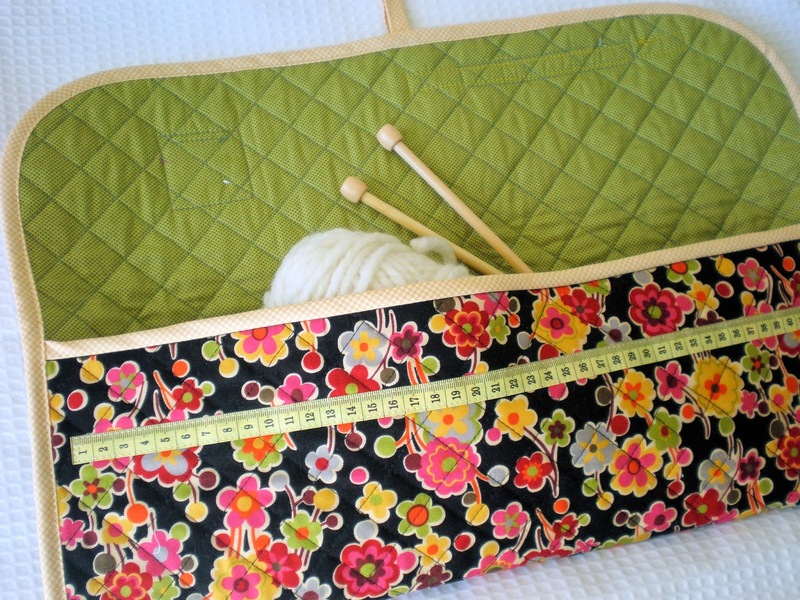 I have been searching for a good place to store my knitting needles and you just gave me the solution!! Thanks so much for sharing! I truly admire your work and enjoy your blog, as always. Enjoy your weekend!! This is so lovely. I could use one of these pouches. Thank you for sharing. Son d’accordo con te e anch’io quando porto in giro mia figlia e devo aspettare tanto tempo, mi porto il lavoro. Con questa busta che hai fatto tu è tutto più pratico e piacevole da vedere. This is such a great (and easy to follow) tutorial! Thank you for sharing. Great idea. I think you do beautiful work! Your binding is beautifully done, mine is always snagged in a few places. Thank you for this – I will be making one. This is so pretty, and so much nicer than some I’ve seen online to purchase! Definitely going to make a couple of these….one for my crochet hooks, and one for other small items I like to keep in my bag(s) that tend to get lost in the crowd! Great tutorial — thank you!